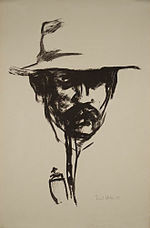 He spent a brief time between 1906-1907 as a member of the revolutionary expressionist group Die Brücke (The Bridge) and as a member of the Berlin Secession in 1908-1910 but he eventually left or was expelled from both of these groups – foreshadowing of the difficulty Nolde had maintaining relationships with the organizations to which he belonged. To a person who has no art in him colours are colours tones tones. He was one of the first Expressionists a member of Die Brücke and is considered to be one of the great oil painting and watercolour painters of the 20th century. His watercolors include vivid brooding storm-scapes and brilliant florals.